The scene pictured left could have been shot in Scotland – a timid deer standing proudly on the edge of a Scottish glen. BUT IT WASN’T. It is a picture of a feral nuisance (Sambar Deer) ripping the foliage off another feral nuisance – a Plum Tree (Prunus sp.) – in our backyard. 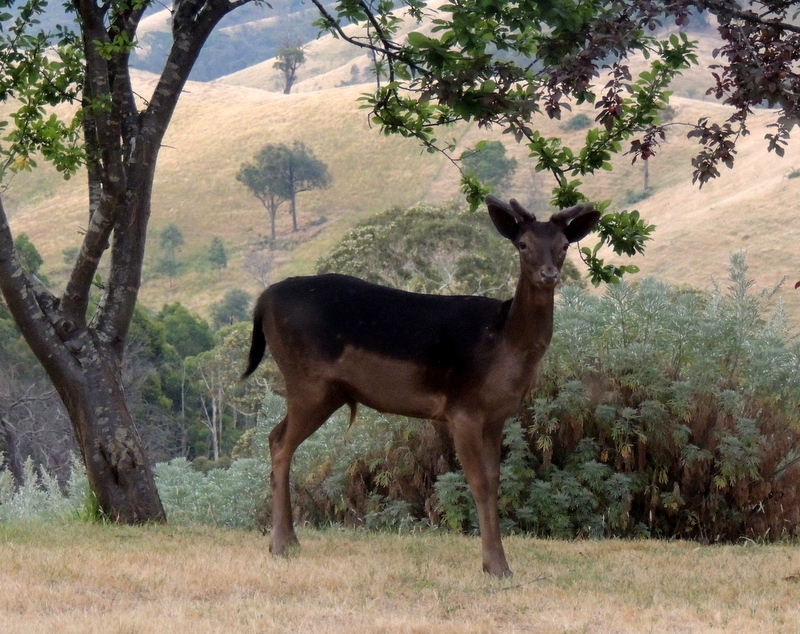 Sambar Deer (Cervus unicolor) were first introduced into Australia from Asia in the 1860s and feral populations have established themselves in areas of SA, Victoria and southern NSW. In previous years we have rarely seen deer around our place. If we did see them, it was usually their rapidly retreating rumps off in the far distance. But this year it is different. They appear to be everywhere. Sambar Deer are largely solitary animals, which means the small herd I saw trotting down our driveway last week was probably of a different species. If I was charitable (or hopeful) I would say it was one of Santa’s helpers doing some reconnaissance before the big day. Obviously not Rudolph. 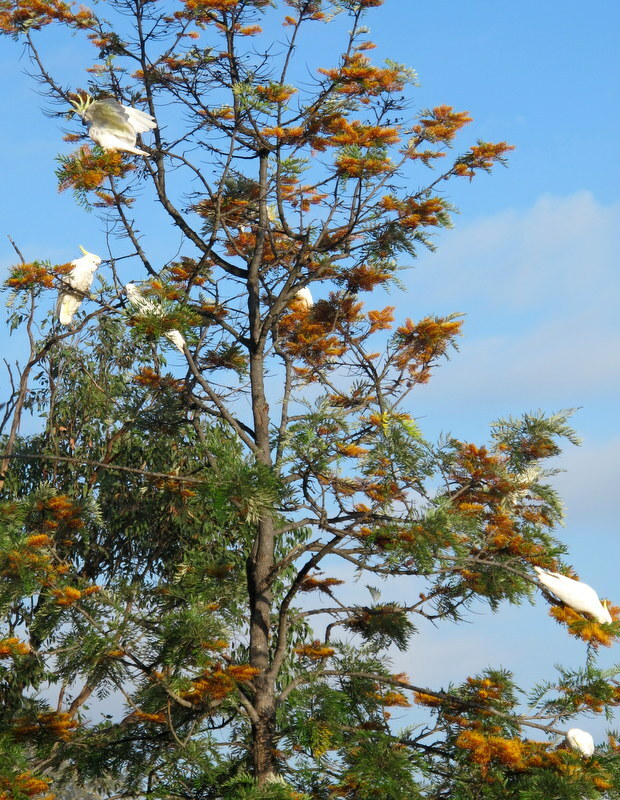 Also fitting in with the Festive theme is our Silky Oak (Grevillea robusta), pictured right, decorated with what look like Christmas baubles, aka Sulphur-crested Cockatoos (Cacatua galerita). In our household, any tree thus adorned is called a Christmas tree, irrespective of the time of year. But the demolition of the Silky Oak by these birds is a true yuletide occurrence that happens in the last few weeks of every year. They obviously find destroying the flowers a lot of fun. Ho Ho Ho. One of our regular followers has suggested to us that the deer pictured is a Fallow Deer (Dama dama) rather than a Sambar. But the ‘feral nuisance’ tag still applies! They are problem right. When it comes to identifying these critters I’m like a blind antelope – no-eye deer!